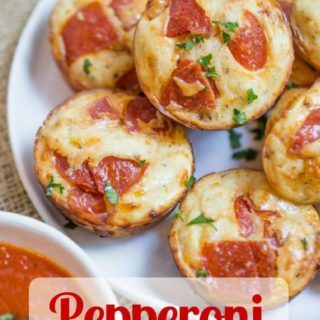 Pepperoni Pizza Bites are a cross between a bagel bite and a pizza muffin and they're ready to bake in just a few minutes. Preheat the oven to 375 degrees. In one bowl mix milk and eggs, set aside. In a second bowl mix flour, baking powder, salt, Italian seasoning, and crushed red pepper. Combine the wet into the dry ingredients and whisk to combine. Add in the pepperoni and cheese and whisk together. Spray baking spray or canola oil spray onto two mini muffin tins and using 1 tablespoon scoop, fill all 24. Alternately make 12 larger Pepperoni Pizza Bites. Cook for 15 minutes-18 minutes, or until browned.